Nero has never before been lauded for its interfaces. But new times and new blood have conspired to make Nero Kwik Media Free, a gratis version of the company's multimedia librarian, player, burner and transcoder--intuitive, of all things. Not 100 percent so, but close. Nero has also opted to make the program dead-simple to use, though the company may have erred too far in that direction. Kwik Media opens to the home screen, where you see common tasks such as burning CDs or DVDs, but you can quickly move beyond those to the video/photo, and music sections. There you can play, organize, and browse your media. The slickest feature is the timeline scroller that lets you jump to time periods. The program also features facial recognition in photos, which is a boon for categorizing your shots. While Kwik Media is easy to fathom and use, it's also dictatorial. The program started scanning for media on the first run without asking, and it was impossible to remove folders that Kwik Media found in this auto-search mode without stopping the scan. The other major issue is that Kwik Media watches all folders you define for every type of media. If you really want album art in your photo collection, this is great; if you don't, it's not. Kwik Media supports a wide variety of file types, converts video to mobile device formats, creates slideshows, interfaces with social sites, and burns media to disc. In its features, it's considerably more versatile than iTunes, Picasa, or Windows Media Player. Kwik Media is a very powerful multimedia handler. It does, however, have a heavy install footprint. Also, you probably already have a multimedia program installed--you really need another? Especially one that feels you're not very bright, limits your options, and starts doing things for you without asking. That said, it's probably worth a look-see for some of the interface features. 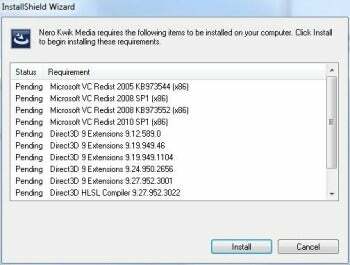 Note: Kwik Media will install the Ask toolbar if you don't deselect this option during the install. Multimedia program Kwik Media is a powerful, if quirky, free multimedia organizer and player for images, video, and audio.